Introduced by Rabbi Eli Brackman, director of Chabad-Lubavitch of Oxford and Sir Walter Bodmer, former master of Oxford’s Hertford College, Yonath took questions from the audience centering on the applications of her work to overcoming a host of obstacles. Of her upbringing in Jerusalem’s Meah Shearim neighborhood, Yonath, who was born in 1939, said that as an only daughter, the first 11 years of her life were her most difficult. Still, at the age of 5, a teacher suggested that she learn mathematics and science after seeing her natural inquisitiveness shine through. She remembered that she once tried to measure the height from the floor to the ceiling in her tiny apartment. She climbed on a chair that she placed on top of a table in order to reach the ceiling, but fell and broke her arm. That was one experiment she never completed, she said, even though she returned to the flat many years later to record a documentary. People called her a dreamer, she said, a trend that continued much later in life. She was ridiculed for 15 years while she attempted to determine the structure of ribosome, an intracellular complex of RNA and protein that synthesizes amino acids. By the late 1970s, she said, top scientific teams around the world had already tried and failed to crystallize ribosome. 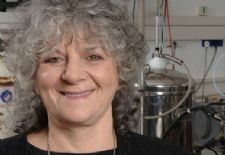 Yonath and her colleagues had to try 25,000 times before they succeeded in creating the first crystals, in 1980. Over the next 20 years, Yonath continued to improve the technique. In 2000, teams at the Weizmann Institute of Science in Rehovot, Israel – where she directs the Helen and Milton A. Kimmelman Center for Biomolecular Structure and Assembly – and the Max Planck Institute in Hamburg, Germany, finally determined the complete spatial structure of both subunits of a bacterial ribosome. At the time, Science magazine counted the achievement among the 10 most-important scientific developments of that year. The following year, Yonath’s teams revealed exactly how certain antibiotics are able to eliminate pathogenic bacteria by inhibiting ribosomal function. Today, Yonath has turned beyond the ribosome’s basic structure to investigate how the complex’s inherent flexibility contributes to antibiotic selectivity, findings which are crucial in the development of advanced antiobiotics. At Oxford, one of the students asked Yonath if she ever had doubts about what she was doing. She responded that she had been accustomed since her childhood to dealing with difficulties. Nothing could deter her in doing what she enjoys, she said. In response to a question about the role of ambition, she explained that she never intended to achieve anything in particular; she merely wanted to conduct research in an area that many had tried before and failed. When the discussion turned to whether she had ever experienced discrimination as a woman in a male-dominated profession, she replied that as she had never been a man, it would be hard to compare her experiences to anybody else’s. Yonath’s talk came as part of a series of events scheduled for the summer term by the Oxford Chabad Society. Past speakers have included members of Parliament, diplomats and professors from around the world.